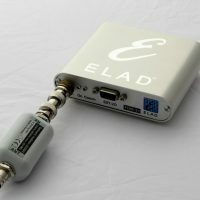 The galvanic isolator GI 300 separates the path of the direct current between the outer shield of the coax cable and the shielding of the antenna feeding line in order to suppress interferences caused by potential differences. A small toroidal transformer is used for this purpose. Additionally, the inner conductor of the coax cable has been insulated with capacitors and coarse and fine voltage surge protection has been integrated. The frequency is being received with a passive 2x15m dipole in Southern Germany. 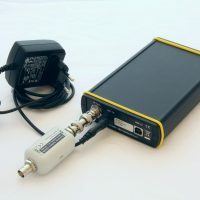 The receiver is a RadioJet 1102 connected to a notebook running on battery power. Here you can see clearly that the noise level rose by approx. 30dB. Almost all signals are drowned out by this noise floor. 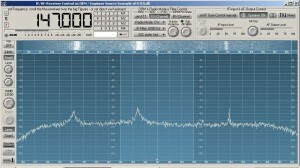 You just get an idea that there is a program on 153 kHz, but basically, the signals are unintelligable. Here you can see the same configuration but the galvanic isolator GI 300 has directly been plugged into the receiver input. Practically, the spectrum is just as clean as in the first picture; you can see and receive all three stations again. 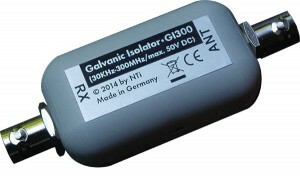 The galvanic isolator GI 300 is no panacea. It is a part that can help to solve a specific problem very effectively. 2. 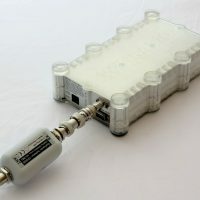 The connection between the galvanic isolator and the receiver input should be as short as possible. Basically, it is impossible for the galvanic isolator to pick up interferences because of its design (toroidal transformer and strip line). HOWEVER: It may happen because of the potential free transmission line. 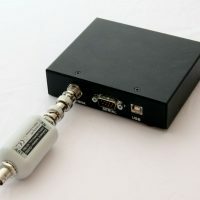 That is why you should connect the GHI 300 directly to the receiver input. 3. In my opinion, the GI 300 is very useful for owners of a PERSEUS who still own the original power supply. This little troublemaker has made life hard for many a PERSEUS owner. If used wrongly, the GI 300 can have adverse effects. If you have no headache, you do not need aspirin. That means that a good ground wire will turn into a bad one if the GI 300 is used wrongly. If you have no galvanic problem, you don’t need a GI 300. Additionally, a double voltage surge protection has been integrated. 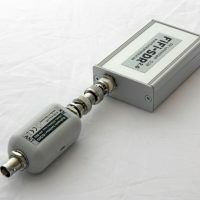 On the side of the antenna, there is a gas discharge tube with an ignition voltage of 90V. 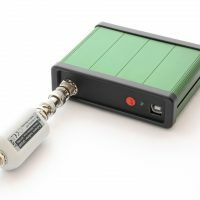 On the receiver side you will find an ESD-diode (30KV; max.pulse power 350W (8/20µs); in addition, input and output has been blocked for direct currents of max. 50V. 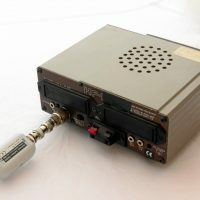 Effective today, you can order the GI 300 by telephone (05052 6052) or in our online shop under www.hamradioshop.net. There will be photos and a video shortly, which will be made at a customer’s house. When using the GI 300, the crackling noise of the PERSEUS and the Elad S1 in the long wave range disappears. With both radios, I can decode RTTY on 147 KHz without error. If I disconnect the GI 300, the noise returns. There were no disturbing crackling noises with my Winradios, RadioJet, SDR-IQ and the Lowe at all. Today, I took the promised photos of the receivers with the GI 300, which I had at my disposal. Everybody can get an idea of the size of the GI 300 now. I will try to find additional receivers. 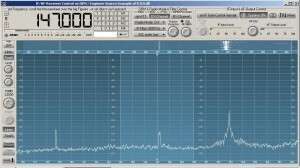 This entry was posted in Bonito Newsroom, Neue Produkte, News, Tips and Tricks and tagged ALA1530, coax cable, Electrical noise, Elektrosmog, FDM DUO, Galvanic Isolator, GI300, interference, noise, QRM. Bookmark the permalink. Would an 8″ to 10″ cable be feasible? As short as possible. I used 10cm.